As some of you might know, my day is job involves diversity and inclusion. While I am a lawyer by trade, I know lead diversity and inclusion at a large law firm. It’s something I am passionate about and so when there is an opportunity to seek out diversity in other aveneus I am all over it. Which is why I’m so excited to be working with Coca-Cola Consolidated on their innovative Soul Food Sessions. Soul Food Sessions is taking their mission to increase diversity in the culinary industry on the road thanks to a partnership with Coca-Cola Consolidated. Washington, D.C. is the second stop of the tour and it’s going down on July 26 at the Mess Hall. This is a sponsored post. What is Soul Food Sessions? Soul Food Sessions is a non-profit founded in Charlotte in 2017 which focuses on raising awareness and providing opportunities for black chefs. The Table is Set is a four-city tour of pop up dinners that are served with a Coke (Coca-Cola Consolidated is the corporate partner). When I first learned about this, I thought it was so neat and innovative that I had to be involved. 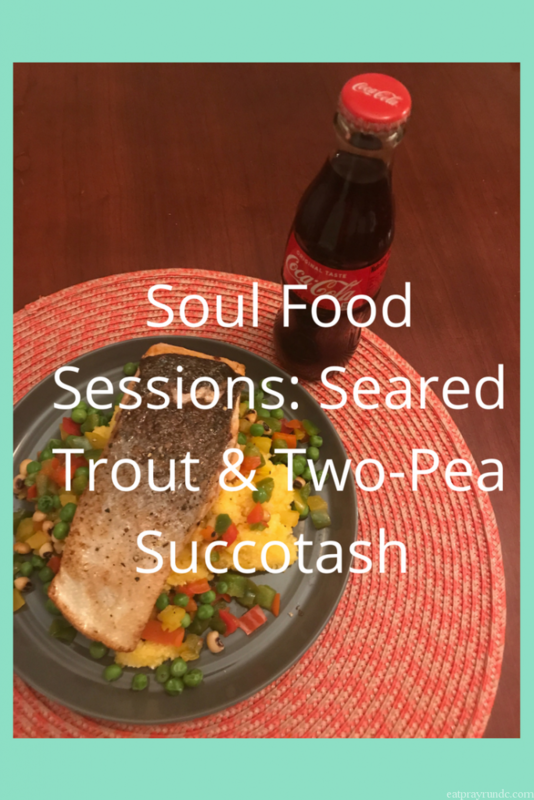 I’m excited to be working with Soul Food Sessions and Coca-Cola Consolidated and thrilled to share this recipe with y’all. Crispy Seared Trout with Five-Pea Succotash (yes you can taste this at Soul Food Sessions!) I picked up all the ingredients at my local Harris Teeter on my way home from work. Note that the official recipe calls for five kinds of peas but my local store had just run out of a couple – so my recipe is Two-Pea Succotash :). 3-4 cups grits of choice (instant or homemade)- I used corn grits because that’s what I had on hand. Heat 2 tablespoonsgrape seed oil and 1 tablespoon butter in sauté pan over medium heat. Next, sauté red onion, bell pepper and yellow pepper until tender (5 to 10 minutes). Add all but English peas, followed by pinch each of paprika and blackening spice, followed by salt and pepper to taste. Remove from heat, toss with tomatoes and 1 tablespoon of cold butter, and then set aside. Heat 2 tablespoons vegetable oil in sauté pan over medium heat. While pan heats, salt and pepper fish on both sides. Sear flesh-side down for 1 to 2 minutes, shaking pan while searing to keep trout from sticking. Flip to sear additional 1 to 2 minutes skin-side down. Rest trout on paper towel. Add lemon to oil in pan and set aside. Spoon your grits into base of plate. Spread succotash across grits. Alternate strips of trout skin side up and down directly on top of succotash. Finish with charred lemon oil from pan. Add English peas and thyme as garnish. Serve and enjoy with a Coca-Cola. 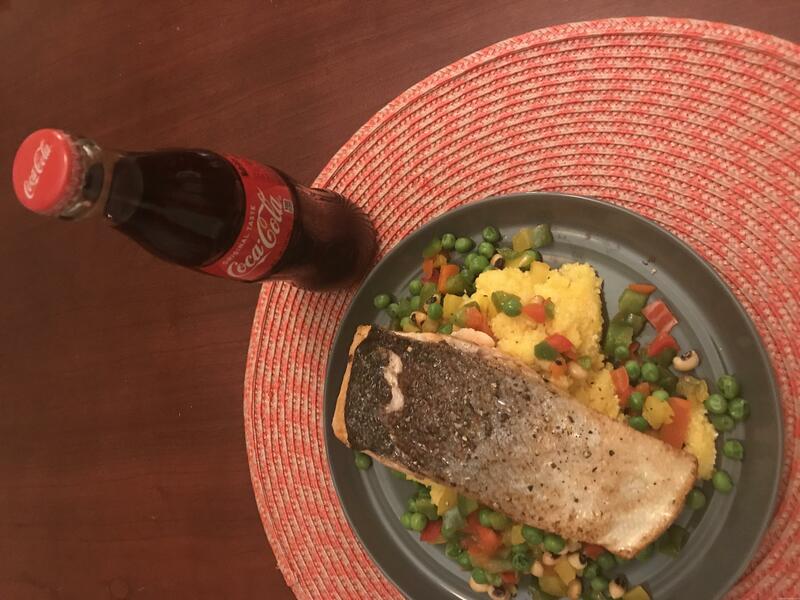 A Classic Coca-Cola pairs with the heat and sweetness of succotash and rounds out the flavor of trout for a refreshing yet unexpected main dish. This was so yummy – really easy to pull together and tasty. I highly recommend it! Curious and want to check it out? Buy your tickets here – I hope to see some of y’all at Mess Hall! I am in a trout kick right now, so I am definitely trying this. Looks so good!